Runtime per charge: 10-15 mins. 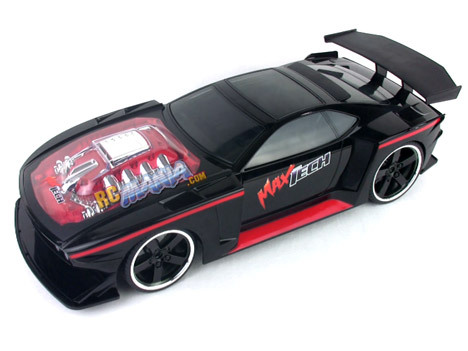 The MaxTech Muscle Tuner is a 1/10th scale RC car that grabbed 100% of my attention the moment I saw it and wouldn't let go until long after I had it home and unboxed. I'll admit it. I bought this for me. Not for y'all. I'm going to re-detail the body and adapt it to an expensive hobby-grade car chassis. However, since I bought the thing, I might as well review it before tearing it apart, right? This car comes as a ready-to-run set complete with rechargeable battery, standard 4-hour wall charger, and even the 9V alkaline you need for the controller. The styling is really amazing, or at least I think so. The clear hood and bright chrome engine details are a little gaudy to an adult's eyes, but plenty of kids will appreciate the bling. Then again, everything about the outward appearance of the Muscle Tuner has some sort of excess. Huge front splitter (lower "wing"), giant wing, massive "wide body" fender extensions, oversized wheels, blacked-out window tint, extra large dual exhaust tips. It's all big & extreme. Surprisingly, even though it's very low to the ground, it has a little bit of working suspension at all four corners. Having tested handful of Maya Group street-style cars in the past, I didn't have high hopes for the performance of the MaxTech Muscle Tuner, but when I hit the road with it, I wasn't really disappointed. It's not what I would call fast, but it's not annoyingly slow either. The controls are not proportional, so you're either at full power or stopping, and either turning or not. On the subject of turning, though, the Muscle Tuner i very responsive to steering control inputs, helping it to feel very alive & agile. From a standing start it also accelerates to top speed pretty quickly, indicating that the motor has more than enough power for the weight of the car and shouldn't wear out quickly. The top speed of the MaxTech Muscle Tuner is too low for the suggested age range, but if you ignore that label and look at this as a big car for somewhat younger kids, then I think the performance is appropriate. I always appreciate the inclusion of a full rechargeable battery setup with any RC, but the price of this complete package still feels like a bit of a stretch. For $60 I'd ideally like to see something more than a car that has basic controls and modest speed. Give us proportional controls, a "turbo boost" speed, some sort of extra interactivity, something. I feel the Muscle Tuner delivers acceptable value, but nothing great. Bonus for the really cool look, though.